Interstate 515 and U.S. 93-95 and Downtown Las Vegas from I-15 north through the Spaghetti Bowl interchange. Photo taken 03/29/08. U.S. 95 travels southeast along the Oran K. Gragson Freeway through northern reaches of Las Vegas to Summerlin and the Spaghetti Bowl interchange with Interstate 15. There I-515 begins and overlays U.S. 93 & 95 (Las Vegas Expressway) east to Downtown Las Vegas and south to Interstates 11 and 215 at Henderson. The urban freeway carries six lanes of traffic as it turns south to cross Boulder Highway (historic U.S. 466). Bypassing Henderson to the west and south, I-515 ends at the exchange with I-215 (Bruce Woodbury Beltway) west and Interstate 11. Prior to September 2017, I-515 extended southeast along side U.S. 93 & 95 to the freeway end north of Railroad Pass. Work here from May 2015 to January 2018 upgraded this stretch as part of the Interstate 11 / Boulder City Bypass. U.S. 93 continues east with I-11 through Boulder City to Hoover Dam while U.S. 95 turns south from west Boulder to Needles and Blythe in California. Interstate 11 will replace U.S. 93 southeast Hoover Dam to Kingman and ultimately Phoenix, Arizona. Interstate 515 was established along the Las Vegas Expressway by AASHTO on July 13, 1976. The designated applied to the one mile section of the freeway linking Interstate 15 with U.S. 93 & 95 (Las Vegas Boulevard). 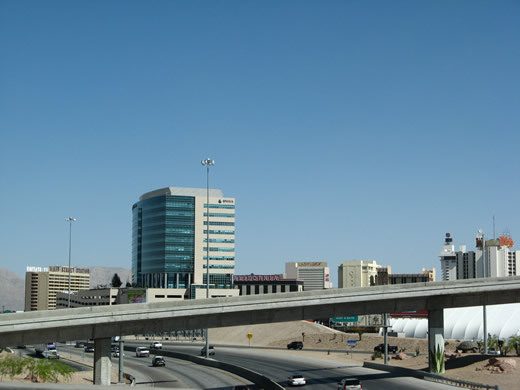 As the freeway was extended south from Downtown Las Vegas, it was signed as U.S. 93 and U.S. 95. An extension of the unsigned I-515 designation was approved by AASHTO on December 7, 1984, lengthening the route south to Henderson. I-515 however was not fully signed until the freeway around Henderson was completed in 1995. Reconstruction of the Spaghetti Bowl interchange, where Interstates 15/515 and U.S. 93/95 come together west of Downtown Las Vegas, was completed by August 2000. The ramp for Martin Luther King, Jr. Boulevard opened in October 1999, followed by the ramp from I-515 north to I-15 south. Work at the exchange with Interstate 215 (Bruce Woodbury Beltway) added high speed flyovers between the two freeways at Henderson. Work here ran through May 2006.